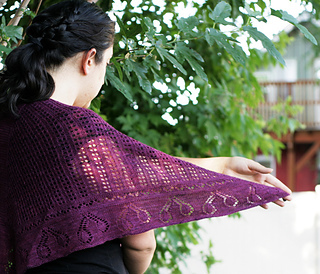 This shawl commemorates one of my favorite things about summer—cherries! From the blossom that appear in the spring to the succulent red and almost purple fruits. 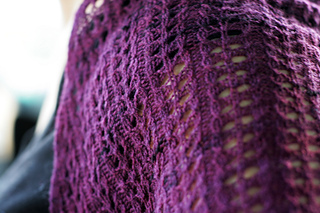 This shawl would also be great knitting during the summer months, when it is too hot for a lot of wool in your lap and a project that travels well is much appreciated. 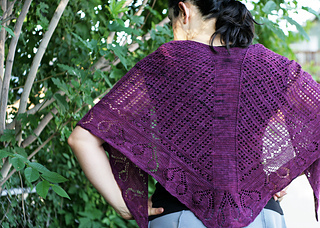 This shawl is constructed from the long angled edge toward the nape of the neck in two wedge-shaped sections. 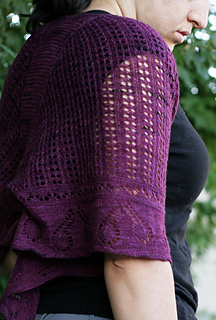 The center back panel, flanked by decreases, creates a Faroese shape to the shawl. The decrease rate is doubled near the top to create the soft curve on the wingspan edge.